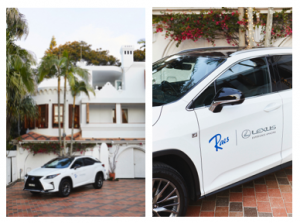 Lexus Australia has forged a new partnership with Raes on Wategos, Byron Bay’s luxury resort, spa and restaurant as it re-opens following extensive renovations. The luxury lifestyle automotive brand will supply Raes with a self-charging hybrid-electric RX 450hL seven-seat SUV for the resort’s chauffer service. It also embraces the Japanese concept of “omotenashi” – the ability to anticipate the needs of others before they have communicated it, which has been one of the guiding principles behind the success of Lexus. Mr Thompson said the RX 450hL is the ideal model to deliver high-end user experiences and is a testament to the company’s commitment to meeting the needs of luxury consumers. “The 7-seater RX 450hL is well-suited to customers who require space, comfort and flexibility provided by seven seats,” Mr Thompson said. “The third row of seats offers the added practicality, convenience and space required by valued guests at Raes while maintaining the sleek styling and easy manoeuvrability that are synonymous with luxury,” he said. New world-class head chef Jason Barratt (previously of Attica, Stokehouse and Hector’s Deli) will lead the re-launch of Raes’ dining room.